With a surface area of 18 square km, Bequia is the largest of the Grenadines. The name means island of clouds in Arawak. Don’t let the name deceive you: Bequia’s lush hills are much lower than the peaks of St. Vincent, 10 miles to the north, so they don’t catch as many showers. 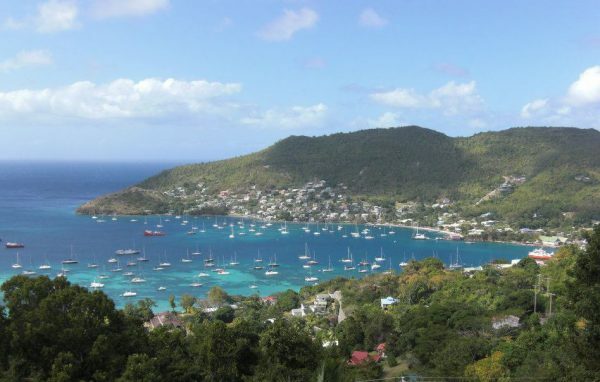 Bequia is a favorite among yachts, expats and vacationers, most of whom will come back again and again to enjoy its hospitable, laid back and friendly atmosphere. For land accommodation there are numerous private villas, hotels and apartments to choose from, ranging in price between $50-2500/night. Our recommendation: combine your stay in Bequia with a yacht charter through the Southern Grenadines with one of our crewed charter yachts. The main port Admiralty Bay and the “town” Port Elizabeth are situated on the leeward coast. The bay is a large natural harbour, so there are always yachts anchored at the pretty beaches lining it. Port Elizabeth has a charming waterfront; take a stroll from the vegetable market, follow “front street” with its many shops, boutiques and restaurants, keep going along the “Belmont walkway” right along the shoreline, maybe stop for a drink at one of the many bars you encounter. From Plantation house the walkway continues on a hilly track to Princess Margaret Beach and Lower Bay Beach. The more energetic can walk to Spring,now Firefly, a former plantation on the eastern coast of the island and from there further north to the turtle sanctuary at Industry. The somewhat controversial Old Hegg turtle sanctuary is a project by Mr. King, since he started sheltering the small hatched turtles we have seen a marked increase in wild of the turtle population. Friendship Bay is a lovely quiet crescent shaped beach, home of laid back and stylish Bequia Beach Hotel. The staff of Bequia beach hotel regularly rakes the seaweed that washes ashore. Sometimes the water is a little rough, please be prudent when venturing swimming then. A little further along the road are two villages, La Pompe and the most densely populated Paget Farm. These are home to the few whalers that are left in Bequia. Traditional whaling is allowed in St. Vincent and the Grenadines with a maximum of 4 per year. Whaling used to be an economic necessity. These days the tradition and taste for whale meat is losing popularity. Many see whale watching as a more viable source of income. The whaling season is from mid January till end of April. Main events are the Bequia blues festival around the 20th of January, Easter Regatta, 9 mornings and Christmas light up and Christmas and New Years celebrations. If you don’t feel like walking there are plenty friendly land and water taxi drivers happy to take you on a tour or just for a ride to your destination. These are very reasonably priced. Even cheaper are the “dollar vans” which run from the ferry jetty to the Southern villages of La Pompe and Paget farm. There are several well stocked grocery stores on Bequia. Numerous bars and restaurants quite often host entertainment. A current agenda is published here: This week’s things to do.